Instead, my hair is in a braid down my back and I’m wearing a long skirt and wedge sandals. I’m sitting in front of a computer with a glass of wine. I insert a link to an article in a newspaper and pinch myself with excitement: I’m a columnist for the Jerusalem Post. The conversations started when snow was on the ground. The drafts went back and forth across time zones and around vacations. Now that the farmers markets are open and the sun is making a regular appearance, the column is hot off the press. It’s called “Come to the Table,” a reference to the French phrase “à table” – the rally cry that gathers family and friends in kitchens and dining rooms morning, noon, and night. The first time I heard it, I was standing in a bathtub in the Loire Valley just a few kilometers away from the Château de Chambord. I had just arrived in France for the summer and had flooded my host family’s bathroom with a hand-held shower head. Panicking, I wrapped a towel around myself, gingerly stepped out of the tub, spread the remaining towels on the floor, dripped my way to the top of the staircase, and shouted down in the most cheerful, insouciant voice I could muster, “je viens” – I’m coming! I threw on some jeans and a t-shirt, swatted at my wet footprints, and joined the family at the table in the garden. I smiled my way through dinner and almost made it to dessert before I was discovered. After a group effort at mopping the bathroom floor, we sat back down to a plate of fruit and the father smiled. “Bienvenue dans la famille” – welcome to the family. It’s in this spirit that I will share in the column stories and recipes from my international travels, gaffes and all. The first article is based on the trip that my friend Sarah and I took last year. We ate our way through Seville and Lisbon and I posted a recipe for salmorejo – a cold tomato soup thickened with bread. 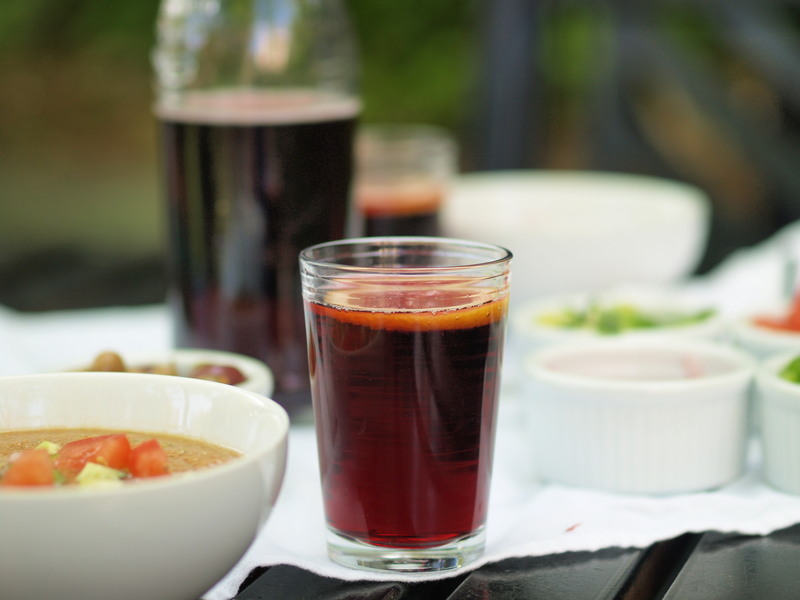 For the Jerusalem Post, I added a recipe for tinto de verano – the red wine of summer – a mix of cold red table wine and lemon soda served in tumblers under the Mediterranean sun. Over the summer, Come to the Table will wander to France and Panama and hopefully find its way into your kitchen. Tinto de verano is a simplified version of sangria popular in the south of Spain, essentially a 1:1 mixture of red table wine and lemon-lime soda called gaseosa. You can substitute Sprite or 7-Up. If you don’t like the artificial taste of soda, make your own with a lemon-lime simple syrup and plain carbonated water. Simple syrup is a 1:1 mixture of sugar and water that can be infused with different flavors or left plain and is often used in mixed drinks. Chill. Chill the red wine. Boil. Make a lemon- and lime-infused simple syrup. Bring to a boil water and sugar and stir until the sugar completely dissolves. Remove from heat. Thinly slice the lemons and lime and drop them into the sugar water. Let cool to room temperature and then chill in the refrigerator. Remove the lemon and lime slices and reserve for garnish. Mix. In a very large pitcher (or two), mix together the chilled wine, simple syrup, and seltzer or club soda. Serve in tumblers with a slice of lemon. What absolutely fantastic news! Congratulations on this wonderful opportunity. Looking forward to enjoying your column. Yahooo! Congratulations, Gayle. I look forward to following along. Thanks everyone. This is such an exciting opportunity and I can’t wait to share more of stories and recipes with the JPost community (and of course, you, my loyal readers).